Do you know where your customers engage on social media, what they’re doing, and how they engage? More importantly, do you know how they view your brand’s social media engagement? If you’re like many marketers, you don’t have a clue. To provide marketing insights into how consumers view brands on social media, here’s analysis of research from Technorati Media, which gathered input from over 1,200 customers for their 2013 Digital Influence Report, and comScore’s, 2013 US Digital Future report. While Google had the most visitors in 2012, Facebook trumped in terms of engagement according to comScore. It’s worth noting that Amazon, a content-rich commerce site with 1% share of total minutes, ranked fifth in terms of visitors. Additionally, Tumblr, a platform that tends to be under the radar for most marketers since it attracts the 13-24 year-old set, had 0.7% of total engagement. For consumers, YouTube (80%) and Facebook (74%) trump other content. The higher ranking of YouTube is most likely due to it’s use as a video consumption vehicle rather than as a social media site. 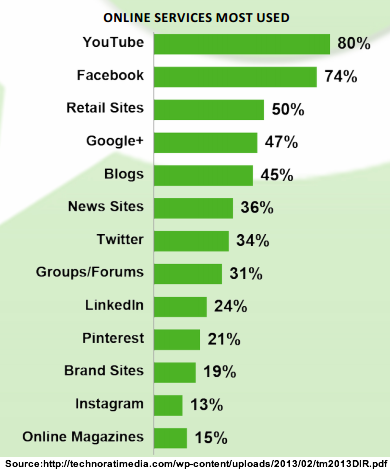 People also consume content on retail sites (50%), Google+ (47%) and blogs (45%). Before you rush to shift your marketing budget, consider that the relatively high ranking of Google+ may be due to a confusion with the search engine based on name recognition. Further, media sites—both news (36%) and online magazines(15%)—are challenged to break through the clutter. Actionable Marketing Take-away: Create some videos and share them on YouTube. Also, add a blog to your content marketing mix if you don’t already have one. Further, if your business targets the under 25 year old set, include Tumblr in your social media portfolio ASAP! 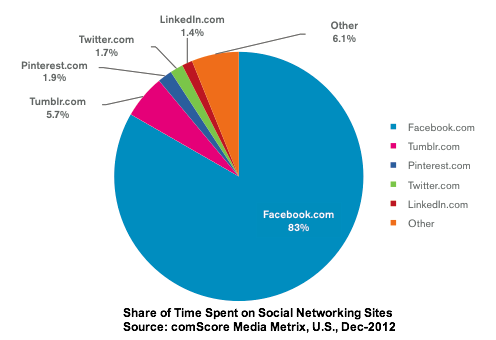 Facebook still has the lion’s share of participant time spent on social media. What’s surprising is that Tumblr, not the more high profile Pinterest, Twitter or LinkedIn, ranks second with 5.7% of time spent on social networking sites. 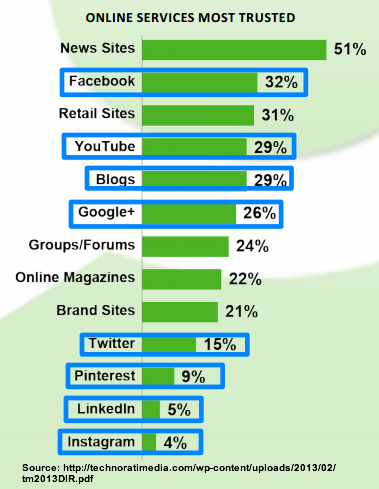 During 2012, Twitter and LinkedIn were relatively close in terms of total unique visitors. Of interest is Twitter’s downturn from June through September which will make it hard for it to regain its footing. What’s important to watch is if this means that Twitter has plateaued as a social media platform. While not on a straight path, LinkedIn has continued to grow. Unlike Facebook and Twitter, LinkedIn has a more diversified revenue model – a combination of premium subscription fees and advertising. By contrast, Facebook is trying to diversify its revenue model and Twitter is still working to define its advertising offering. Where would social media be without photographs! As with other measurements, Facebook dominates in the sheer number of images. That said, Tumblr, Pinterest and Instagram (now owned by Facebook) are all image-focused social networking sites. As shown below, Tumblr has experienced steady growth relative to Pinterest and Instagram. Actionable Marketing Take-away: Diversify your social media presence. Since Facebook remains the 800 pound gorilla of social media by most metrics, you need a presence there. As a marketer, you need to ensure that you’ve staked your turf and started building on appropriate social media entities for your brand and business. Customers generally don’t trust social media, although they trust the big sites more than the little platforms, based on Technorati’s research. Brand sites fall in the middle of the pack. About a fifth of respondents trust them. Despite their relative lack of trustworthiness, consumers are willing to share content from social media sites. While a quarter of them will share information from blogs (a form of social media), customers won’t share content from brand sites. Actionable Marketing Take-away: Create video and blog content to encourage social sharing rather than relying on your brand website. Consider how you can make your content useful to your audience. 4. 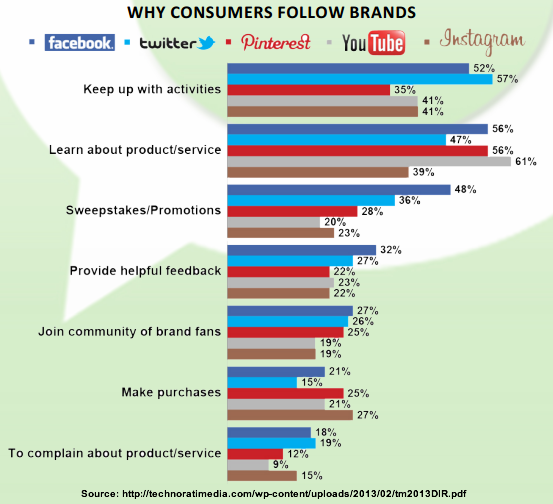 Consumers follow brands on social media: Do you know why? Brands must be on social media because consumers use these outposts to seek brand and product information. Beware, this doesn’t mean that you should spam them with promotions! YouTube (61%) trumps for learning more about products and services. This means how-tos and 360° product views as well as entertaining videos like Blendtec’s Will It Blend. Social media is where the discounts are! Understand that consumers actively seek discounts. (Here’s pricing research where discounts rank higher.) Don’t forget to include these savings in your pricing. As with any communication point, expect customer feedback, both positive and negative. Understand that on social media, naysayers have a megaphone to which others listen. This translates to having people ready to respond to customer service on social media platforms. With regard to social media posting, most consumers think that brands are too active. If you’re in doubt about your brand’s social media updates, chances are that you’re posting too frequently for your fans. Actionable Marketing Take-away: Create videos to show how to use and style your products to distribute on social media. Also, incorporate the discounts and promotions you use on social media in your overall pricing to ensure that it’s competitive. Further, use tailored landing pages to help convert prospects. 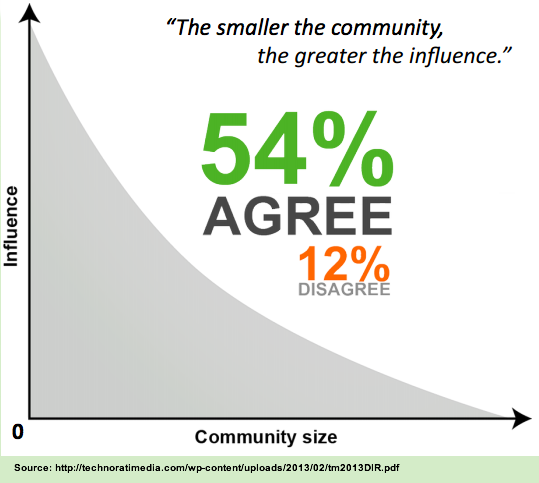 For brands looking to engage with prospects, customers, fans and the public, it’s critical to consider community size. As a group gets larger, it’s more difficult to interact at the same level of engagement. 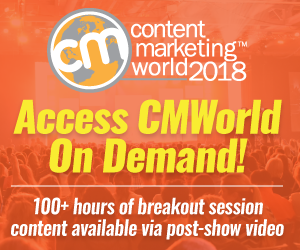 Actionable Marketing Take-away: Before building your social media community, determine how you want participants to be involved and how it advances your business goals. Understanding where your target audience is on social media and how they view and use your content is a critical part of achieving your marketing goals. It’s the key to creating the information prospects and customers seek and share. What’s your view of brands on social media platforms? Consumer trust – Do you have it? 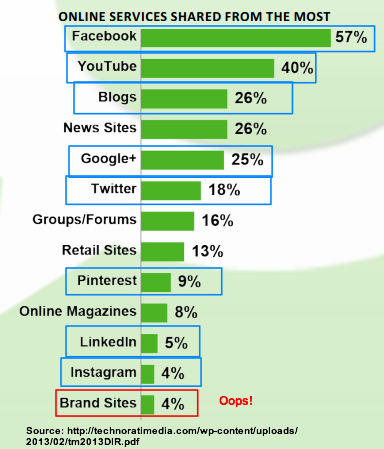 Tags Charts, comScore, Facebook, Instagram, LinkedIn, Pinterest, Research, Technorati, TUmblr, Twitter. Bookmark the permalink. What I loved about this post is that you not only shared the data, but explained to us what it means. Too often I find posted stats with no explanation to why it’s relevant. Thanks for a great post! Excellent article, thanks for sharing this great research. Love your take aways! Thanks for not just sharing stats but giving them meaning, or as your brand stats actionable. Often times, the first thing I do when I discover a new eCommerce site is to read reviews or to find them on social media. I like to see how they interact with their customers before I purchase from them because, as a deal hunter, I want to know if the site is legit or not. Great post! 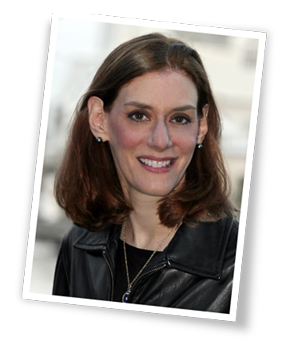 Heidi – I am always in awe of your posts and wonder where you find the time (and info) to create them. Do you know if YouTube’s ranking is pushed solely by visits to YouTube, or if YouTube videos embedded on web sites add to that total? With regard to YouTube, I don’t have insights into the specific data so I don’t want to mislead you. Understand that YouTube is considered a video site by the metrics firms like Nielsen. It is a social media/content site. In terms of size, it’s the number 2 social media site and the number 2 search site.